The secret to making crêpes begins with the batter; no matter how wonderful the fillings are, for a great crêpe you need to start with a great base. 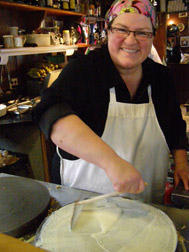 Chef Catherine Schmuck, the owner of the charming Crêperie Catherine located in the heart of the Pedestrian Village in Mont-Tremblant, Canada graciously shares her recipe for making perfect crêpe batter. Bon Appétit! Edward and I had an excellent lunch at Crêperie Catherine in late February 2011 where we had the opportunity to get to know a little about Chef Catherine Schmuck and her culinary philosophy. Originally, from Ontario, Canada, she is a woman who bubbles with enthusiasm and who knows no limitations. She was an assistant cook in the Merchant Marines traveling on the Great Lakes cooking for a crew of 30 men, and when the opportunity arose to become the head chef, she quickly accepted, although she had no prior knowledge of how to make soups, sauces, or gravies. On a ship that typically is at sea for long stretches of time, often up to 60 or 90 days, mealtimes are the highlights of the day for the crew. While other people would have thought twice or three times before accepting, this was not a problem for Catherine, she simply opened up a cookbook and learned day-by-day on the job perfecting her recipes to the excitement of the crew who came to look forward to what she would create each day. Catherine's sister, Lorraine Schmuck was also a cook in the Merchant's Marines, although they worked on different ships. On Catherine's last ship, she met her husband, François Laviolette. 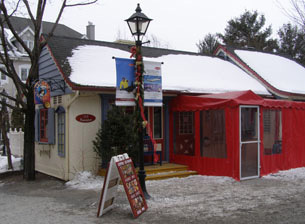 When the three left the Merchant Marines, they wanted to open a delicatessen in the Pedestrian Village in Mont-Tremblant, and saw an old chalet that they thought would make the perfect home for their restaurant. However, I should probably note that the chalet, although it had a certain charm, was rather rundown and was located at the foot of the mountain rather than in the desirable Pedestrian Village, and the Village would only approve them if they opened a Crêperie although they knew nothing about making crêpes. Not a problem for these intrepid three, they simply moved the chalet, renovated it, learned the art of making crêpes, and opened Crêperie Catherine in 1995, where it has since become a favorite Mont-Tremblant restaurant. When not working at the restaurant, Chef Catherine Schmuck, a dedicated foodie, enjoys traveling on her days off and trying new restaurants. She feels that the secret of making a great crêpe is in letting the batter rest in the refrigerator overnight, which will create a more delicate crêpe. As for the fillings at Crêperie Catherine, they use ingredients that they like, and not necessarily what you would find on menus at other crêpe restaurants. 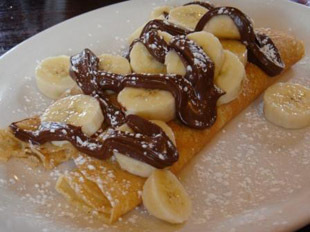 Crêpes are wonderfully versatile and lend themselves to sweet or savory recipes; the possibilities are endless. Bon Appétit! Method: Beat eggs. Continue beating while alternately adding flour and milk a little at a time. Blend in the sugar and the melted butter. Let the batter rest in the refrigerator overnight for best results. Batter will keep in the refrigerator for three days. Crêperie Catherine is open for Breakfast, Lunch, and Dinner daily from 8:00 am until 9:00 pm. There are no reservations. 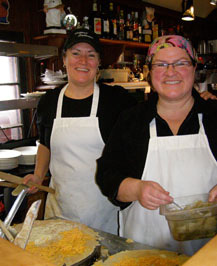 Read in-depth about Crêperie Catherine in the Restaurants section.